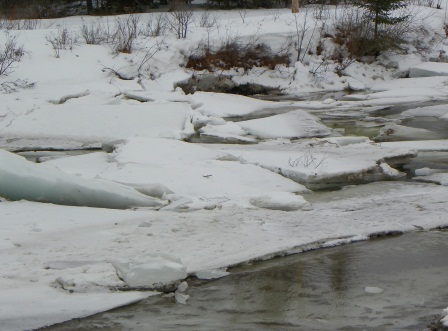 Rain and slightly warmer temperatures this week raised water levels and the ice on the river, upstream of our village, is breaking up. Snow on the banks is collapsing, adding to the floes, and a jam yesterday forced water out of the channel and into the fields. 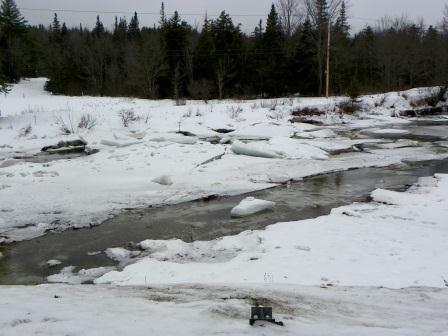 The water has receded somewhat today but, if the ice jam lets go, there could be big trouble in town. The barn roof finally released its icy crust, all at once, in a sheet that came crashing down, shattering as it went, sending angular chunks sliding across the dooryard. Heard a woodpecker drumming yesterday and the chickadees have changed their song. Saw a grackle at the feeder this morning and the willow branches are showing color so, evidently, nature’s children are more confident of spring’s approach than I. The snow still looks deep, out in the woods, and as I contemplate the first walk in the woods this season, sans long johns and heavy wool trousers, I am faced with a quandary. Will I need my snowshoes? The snowbanks close to home are firm and can be walked on; the path to the chicken coop hasn’t gone punky at all, and it sure would be nice to hit the woods again without the extra weight on my feet. 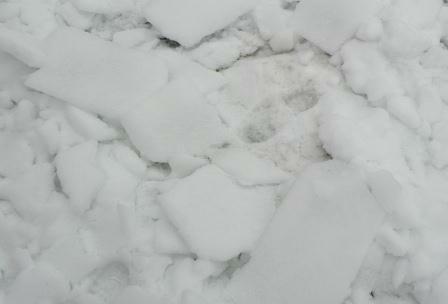 As snowshoes go, mine are quite light-weight, but it does get old after a while, all that high-step slogging. A friend of mine was describing a wonderful new machine at the gym where he works out — a stairmaster kind of thing that simulates inclines, varies resistance both up and down, and gets his heart rate way up there for good cardio health — and it sounded a lot like snowshoeing to me. Not that silly strolling along on a packed snowmobile path or groomed cross-country ski trail, but honest to goodness wallowing through deep powder. Break trail around here with me for a couple of hours; we’ll get that heart rate up to where your eyeballs throb. So how does one find out if the snow in the woods has packed and settled enough to walk without snowshoes? I am glad you asked because I have come up with a way to scientifically determine the depth and texture of March snow in the woods and now you can, too. 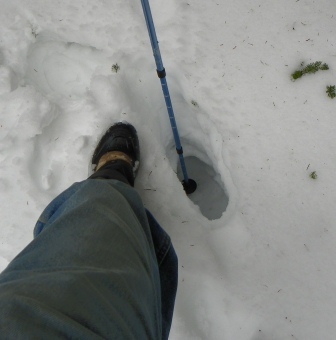 The first thing you need for this method of snow depth measurement is a pair of snowshoes. Leave them at home, on the porch. Now, walk back home and get those snowshoes from the porch. You got a good sense of humor I can tell. Just good, down here in SE Texas we don’t have that problem with snow and ice. People here don’t know how to drive their cars when only a few snow flakes are coming down maybe any couple of years, so how would they be able to walk in really deep snow? But I know what you are talking about since I grew up in Europe where we really had cold winters with lots of snow. Anyway, your post gave me a good laugh. Rick, I lived near Dallas for a while. A few snowflakes fell and everything shut down but during a big ice storm everyone kept going until they crashed.